Overview: The X-Men return from the Secret Wars to face new adversaries, including one by the name of Adversary, in this next Essential from Marvel Comics. The team is going through some change. Storm loses her mutant abilities after being shot by a gun designed to take down Rogue. Rachel Summers travels from the future to join the team, only to discover that her future cannot be, as her mom no longer lives. Kitty Pryde and Wolverine take leaves from the team, but soon return back to the fold. The X-Men cross paths with Selene, an energy vampire who craves their mutant blood. Selene puts herself in position to be named the new Black Queen of the Hellfire Club, longtime enemies of the X-Men. In a battle against Kulan Gath, first seen in the Conan the Barbarian comic, and his attempt to change reality, the X-Men, the Avengers, and Spider-Man are brought together to stop him. Two issues stand out, both from Claremont and guest artist Barry Windsor-Smith. Lifedeath (Issue #186) and Lifedeath II (issue #198) deal with the powerless Storm looking to come to grips with the loss of her mutant abilities. Issue #186 finds her confronting the inventor of the gun used to strip her of her weather controlling abilities, Forge. As much as she wants to hate him for what he has done, she finds herself attracted to him and his story. In the sequel story, Storm has travelled back to her home lands in Africa, to reconnect with who she once was, and to explore who she could become. What makes this Essential? : Not that there is ever any truly “normal” time for the residents at Xavier’s mansion, but this really seems like the calm before the storm – no pun intended. We get a lot of one-and-done stories. If they do spill over, it’s just for one more issue. A lot of going back-and-forth with the kids from New Mutants. Beginning with the next Essential volume, it becomes one event after the next, with hardly a moment of quiet time to be found in the books. Enjoy these moments while you can, because nothing is the same following issue #200. If you are a fan of the epic stories across multiple titles, skip this volume and move onto Essential X-Men Vol. 6. Footnotes: In an ongoing move to include additional material, Marvel adjusts the content listings between the first edition and the second edition of this Essential volume. The first edition contains annuals #7 and #8, while the second edition contains annual #8, along with X-Men/Alpha Flight #1 and #2. If you like this volume, try: the Kitty Pryde and Wolverine miniseries from 1985 by Chris Claremont and Al Milgrom. Following the X-Men’s return from the Secret Wars event, Colossus breaks things off with Kitty in Uncanny X-Men #183. She needs a break from her environment and takes a leave of the team to visit her parents. Returning to Chicago, Kitty finds that her dad is in Japan under mysterious circumstances. Following her father halfway around the world, she encounters a mysterious figure from Wolverine’s past, which provokes our favorite Canadian to join up with Kitty in Japan. During this series, Kitty matures into a young adult and settles on the codename of Shadowcat, which has been her costume name ever since. This is an excellent series and has remained in print for years in both trade paperbacks and hardcover collections. This entry was posted in Marvel Essentials, X-Men and tagged Barry Windsor-Smith, Chris Claremont, John Romita Jr., Paul Smith, Steve Leialoha, X-Men. Bookmark the permalink. 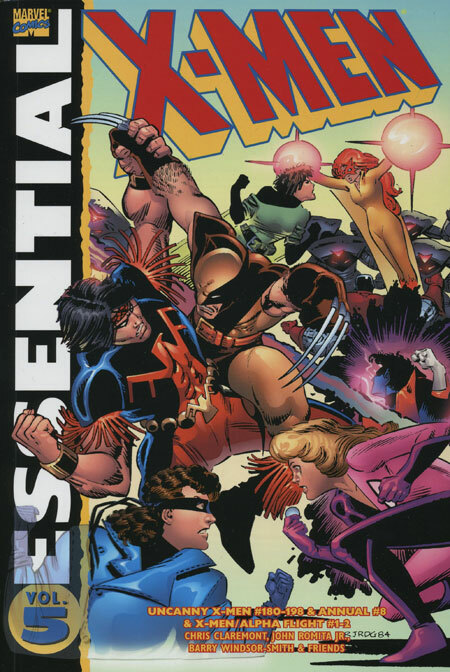 Pingback: Throwback Thursday – Essential X-Men Vol 5 – WORST. COMIC. PODCAST. EVER!